In 2014 I decided to create a collection of technical articles to share the main ideas and studies I have made on the field and also to keep track of the evolution of some of my work. Now I am releasing the third edition, including 2 new articles I published in 2018 and 2019. Time flies and just to remember, one of the classical articles was the one about the new approach to the PMBOK® Guide. 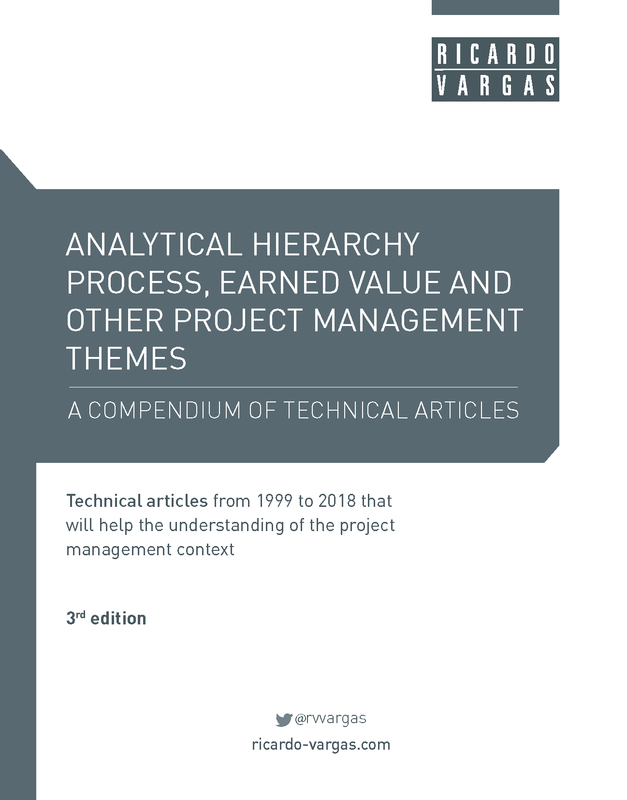 For many new project managers, the article may be perceived as an old article, but the concepts presented in the article were a major driving force to the changes presented in the third edition of the PMBOK® Guide that now presents the data flow diagram in Chapter 3. Another topic that I cover in several articles is Earned Value Management, the central topic of my master thesis. I also discuss human resource aspects and Monte Carlo simulation applied to project management. In few years ago I started studying Qualitative Risk Analysis, Sustainability in project environment and Return over Investment of Project Offices and Analytical Hierarchy Process. One of the most intriguing articles was about Neural Networks. When I presented it in 2015 nobody was even thinking what would happen with Artificial Intelligence and Machine Learning. The process I introduced using Microsoft Excel and the Palisade Neural Tools is today present in most of the cloud based solutions and for sure one of the hot topics for the upcoming future. The most recent articles cover basically my work at Brightline Initiative in topics related to the implementation of strategy. Written in partnership with Edivandro Conforto, Brightline Initiative Head of Strategic Research, they discuss the key elements to be in place in order to get things done: from the design of strategy up to the delivery of benefits. I hope you enjoy this third edition. For sure I intend to keep this book updated with new articles in the future.